2015 marks the 25th Anniversary for Rocky Mountaineer and the company has a lot to celebrate. 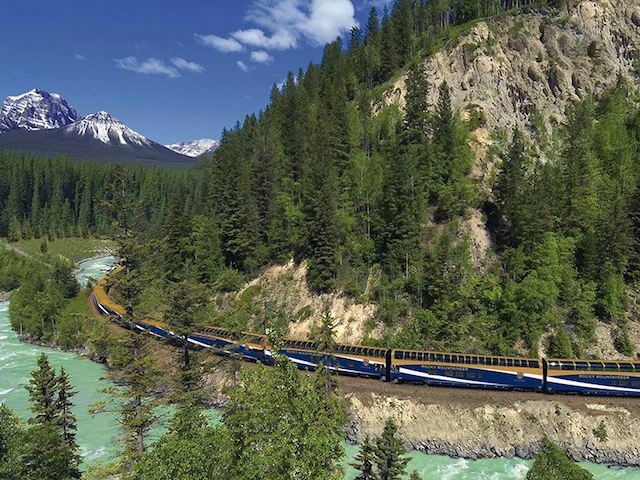 Since its inception in 1990, Rocky Mountaineer has grown to be the largest privately owned luxury tourist train in the world and is considered by many as the only way to see the Canadian Rockies. In the past 25 years, the train has welcomed onboard nearly two million guests from around the globe. With over 45 vacation packages, five unique rail routes, and iconic destinations such as Seattle, WA, Vancouver and Whistler, BC, and the majestic Canadian Rockies in Alberta, there is a journey for anyone looking for a life changing experience. The world renowned train travels by daylight through the diverse landscapes of the Pacific Northwest and Western Canada while guests relish in the breathtaking views of tumbling waterfalls, glacier-capped mountains, and wildlife of the regions. Rocky Mountaineer has received numerous international awards and accolades for service excellence, including eight World Travel Awards for both “World’s Leading Travel Experience By Train” and “World’s Leading Luxury Train.” In 2013, it was also recognized as one of the world’s “Dream Trips” by the prestigious Travel +Leisure magazine.